the fourth of the july weekend is almost upon us! in perusing patriotic recipes, i came across the usual suspects – the strawberry, blueberry + whipped cream parfaits, the cake decorated with fruit to looks like the american flag, + then i came across red, white + blue stained glass jello shots. hello? major breakthrough on the fourth of july recipe front. while jello shots usually conjure up images of frat parties, these definitely bring a new level of class to jello shots. let’s be honest – these are never going to be creme brulee or profiteroles. however, they are pretty enough that they could easily attend any fourth of july party. + the flavor? surprisingly good! the condensed milk lends a creaminess that makes them quite tasty + the booze is almost undetectable, which is both wonderful + dangerous. so, if you’re looking for a recipe that will stand out from the ol’ fourth of july regulars, this is definitely for you! pour the flavored gelatin powders into two separate bowls. divide the hot gelatin mixture + add one part to each bowl. stir until dissolved. let cool for a few minutes, then stir in the liquor. pour into four separate containers to chill. chill until fully set, several hours or overnight. pour water into a medium saucepan + sprinkle with the gelatin. allow to soak for a minute or two. heat over low heat, stirring constantly, until gelatin is dissolved (about 5 minutes). stir in the condensed milk. set mixture aside to cool to room temperature. remove the colored gelatin from the refrigerator + cut into small blocks. carefully mix the blocks as desired + place in a 9 x 13 glass or non-reactive metal pan. return blocks to refrigerator until milk mixture is cool. once the milk mixture is cooled, divide equally + pour it over the gelatin blocks. skim off any small bubbles that form. chill until fully set, several hours or overnight.to serve, cut into squares + plate. I love these! So pretty and so versatile, I bet you could change the colors to fit any occasion. Nice! Saw someone do these the other day! I think they sound too easy not to do for the 4th party! Print! Ooh, these are so pretty & easy to make! And i love your suggestion for Leah about tailgates. We’re season tix holders for both UGA (me) and Bama (hubs) games. Brilliant idea! Now i just have to find black jello…. So cute Amy-hope y’all have a safe & terrific 4th! thanks, girl! a tip for when you make ’em – mccormick makes black food coloring that you can use to darken any of the other colors. it might still have a tinge of the original color but will look mostly black. i’m going to try some two-toned blue ones for the tennessee Titans season! have a great 4th! Definitely takes me back to college! These look alot better tho! woohoo! yes, if you have strawberries + blueberries, here are two easy, crowd-friendly recipes that you might dig. random that both are from the same site, but i’m rolling with it. let me know if you want more cake/cookie/baked typed recipes – i have plenty of time to hunt some down for you tonight + tomorrow. Ok. These are just out of control beautiful and delicious looking. I thought I was over jello shots but these, well, have made me reconsider. cute + festive + booze = win! Great idea…how cute! 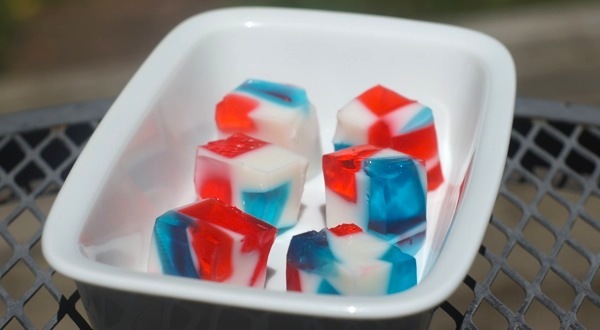 I may have to make these for a summer party in a different set of colors…I’ll be on VACA in Chicago over July 4th, so I won’t be able to make any of the fun red-white-blue recipes I’m seeing! they’d definitely be cute using sports team colors or other holiday colors, so i can’t wait to see what you do with ’em. have a great vacation + a happy fourth of july! I’m not a jell-o eater, but I just wanted to say that they look a bit like those soaps they sell in chunks. I can’t remember the name, but they smell great. you can try ’em out even if you aren’t having people over. =) more for you! Those are adorable!! Wish I’d found this post yesterday.. Ah, well, I’m sure I can find an excuse to make them.